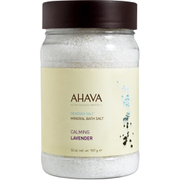 Enjoy a relaxing bathing experience with the SpaRitual Look Inside Bath Salts. Working to relieve and calm stressed skin, the revitalizing salts comprise a mineral-rich blend of locally harvested California Sea Salts, Dead Sea Salts, and Epsom Salts to gently cleanse, soften and hydrate wanting skin. Promoting blood circulation, the bath salts will leave skin with a smoother and brighter appearance. Vegan. Made with certified organic ingredients. Maris Sal (Sea Salt/Sel marin), Magnesium Sulfate, Carthamus Tinctorius (Safflower) Seed Oil, Parfum (Fragrance), Helianthus Annuus (Sunflower) Seed Oil, Boswellia Serrata (Frankincense) Gum, Glycerin, Galactoarabinan, Tocopheryl Acetate, Sorbitan Oleate, Silica, Illite, Benzyl Cinnamate, Citronellol, Eugenol, Geraniol, Limonene, Linalool.